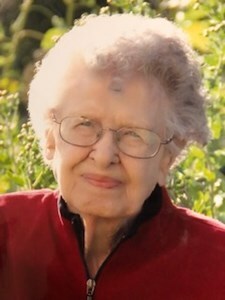 Ione Marie Carnine, 104, Topeka, passed away Monday, April 1,2019. Ione was born December 2, 1914 in Aberdeen, SD, the daughter of Guy C. and Clara Belle (Fulker) Lindsey. She graduated from South East High School in Kansas City, MO. She was employed by Fairmont Creamery in Council Grove, Blacktop Construction and RedX pharmacy as a bookkeeper in Emporia. She was a lifetime member of Miriam Chapter O.E.S., First United Methodist Church both in Emporia and First Southern Baptist Church of Topeka. Memorial services will be held at 1:30 p.m. on Saturday, April 13, 2019 at First Southern Baptist Church. The family will receive friends at the church one hour prior to the service. Private family inurnment will be in the Paola Cemetery. Memorial contributions may be made to First Southern Baptist Church, 1912 SW Gage, Topeka, KS 66604 and Gideons International. Add your memories to the guest book of Ione Carnine. Thinking of you and your family and good memories of our Council Grove years. Your Mother was a fine person. I especially remember and appreciate her visit with my family in 1980 after the unexpected loss of my Mother. The Memorial Video of Ione is wonderful! You have a beautiful family. May your family and good memories comfort you always. fondest memories and sincerest condolences from the family of Jack Logan - Ione worked with my dad at Blacktop Construction. May your family be embraced with the hugs of many wonderful memories! Carol and family.. the time that I helped take care if Ione was a special time for me. I remember the first time I met her, we just had a special connection. I am thinking about all of you and all the memories I have of Ione.